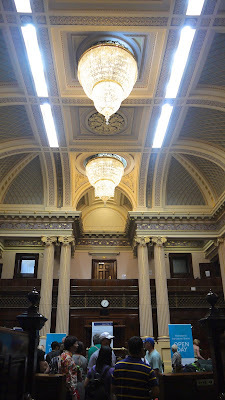 So In Love With Melbourne: Is it worthwhile to visit the Parliament of Victoria? 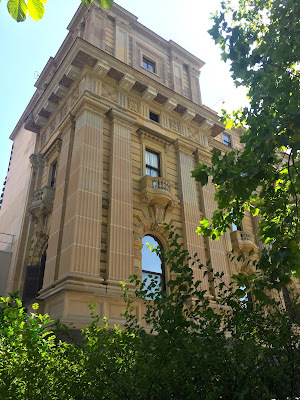 Is it worthwhile to visit the Parliament of Victoria? Many think that the Parliament of Victoria is just another “been there and done that” tourist site in Melbourne. I ashamedly confess that I, too, used to fall within such category and had never taken a serious look at this bold and imposing 19th century building. We visited the Parliament’s Open Day on 6 March 2016. The exhibitions in the Queen’s Hall were informative, and the staff on duty was extremely friendly and always ready to offer additional knowledge and facts to the visitors about the parliament and its role in enacting the state laws. What was lacking, in my humble opinion, was the attempt to “modernize” the parliament’s image as the 21st century leader that would bring the State of Victoria forward as a progressive place in the world. There was no modern touch-screen display educating the public on the importance of staying in touch with the latest government’s initiatives, no interactive computerized exhibitions to trigger the interest of young children and new generation to be part of the privilege group in shaping the policies of tomorrow for the state of Victoria. The display of paper brochures and parliamentary reports neatly arranged on long tables covered in boring white cloths was, alas, not that interesting. The only attractive items on display were probably the free souvenirs - some Victorian Ombudsman ballpoint pens, Parliamentary Committee pencils, and some fancy looking sweets. There was definitely much room to be improved. But still, kudos to the amazing staff that worked on a Sunday to bring the event a success. So, the next question is: “Is it worthwhile to visit the Parliament of Victoria?” Definitely a “yes”, and I recommend joining the free public tour to have a glimpse of the very impressive and awe-inspiring interior of the building. Also commonly known as the lower house of the parliament, the interior of the Assembly Chamber is decorated in green of different shades. The carpet is in a sea of grass colour of oak-leaf design; the old-styled leather couches are in a darker shade of green, resembling the colour of some sparkless emeralds; the speaker’s chair is in a shade of dark seaweed green, sandwiched in between two gigantic pairs of white Roman style columns. Three Waterford crystal chandeliers gracefully suspended from the intricately crafted ceiling, like some shrewd gleaming eyes constantly watching over the legislative proceedings on each sitting day. This lavish Corinthian-style chamber is furnished in a striking sea of bright red. Large Tasmanian freestone columns surrounded the chamber, resembling some giant guards protecting the sanctity of the democratic process. A royal lion, crown and unicorn proudly sit on top of the Canopy, watching the back of the President at all times during each of those fiery parliamentary debating sessions carried out in the flaming red chamber. The library is by far my personal favourite of all the rooms in the parliament. Columns with shiny gold gilded capitals standing tall over two levels; a brass chandelier of 2,000 pieces of crystal cascading down from the magnificent dome ceiling, like a glorious waterfall eager to showcase its beauty to the collection of thousands old leather-bound books and archaic materials. The library is located between the two legislative chambers, serving as a bridge of knowledge between the two houses. For a price of $10, we got to enjoy our afternoon coffee and tea, with unlimited raisin scones served with scrumptiously thick double cream and jam. Love them! The Members’ Dining Room features extensive timber paneling around the walls, red-velvety dining chairs, and carpeted floor in royal red. The Queen’s Hall was named in honour of Queen Victoria (1819-1901). A marble statue of Queen Victoria stands at the east end of the hall, overseeing the portraits of former premiers of Victoria hanging at the intricately designed white walls. The 22 semi-circular windows allow natural lights to shine through the glorious-looking hall. The Queen Hall now serves as a grand and luxurious venue for various ceremonial occasions, official receptions, dinners and exhibitions. Unfortunately, the vision of the architect Peter Kerr for the Parliament House has not been fully realized. The original design of a dome sitting atop of the Vestibule (which was listed at a cost of around £54,500) was not built, and certain parts of the building structures remain incomplete as at todate. Free public tours are available on non-sitting days. Check out for the date and time of tours from here.